Well, here I am again, a month later finally posting here. Clearly something needs to be done about busyness and too many obligations. But, one of those obligations I took on was for total fun! And creativity. Some of my co-workers had been going to Tipsy Artist, a little art gathering where you pay $40 and go paint while you have cocktails. One girl was like, hey, why don't we just do this at my house, save the $$ and still paint with cocktails. So that's what they've been doing and I joined them last night. It was awesome. I haven't painted in like 5 years and I haven't done anything non-abstract since like 1998 or so. AND nearly every painting I've done in the last 15 years was HUGE ... like 5' x 3'. Something that's very difficult to do at home and that can be overwhelming. 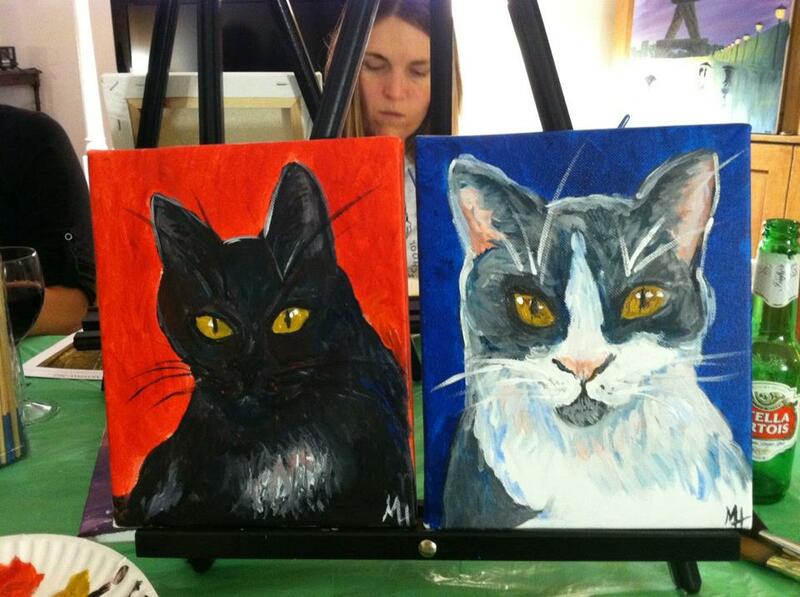 My masterpieces from last night ... kitty portraits on 8x10 canvas. Quick, sweet and soul nourishing. I loved it! And the paintings pretty much look like the cats! I can't wait to do it again and now I've realized, I can paint at home!